[Off Topic] TOS: "The Grey: A Great Reminder of Crucial Truths"
Off-topic: The blog for The Objective Standard has posted my short piece, "The Grey: A Great Reminder of Crucial Truths". Legal implications of terahertz imaging: "Drive-by Gun Scans Prompt Privacy Questions"
"Magnetic soap made for oil spills"
"The world's first computer password? It was useless, too." "204 Lay's Potato Chip Flavors from Around the World"
"Sh*t Programmers Say". Watch through to the end. "Serious Flaw Emerges In Quantum Cryptography"
"Tablet full of crude gags and riddles about beer is found -- dating back to Exodus". "Why Video Games Are Good For You"
"Hawaii's legislature is weighing an unprecedented proposal to curb the privacy of Aloha State residents: requiring Internet providers to keep track of every Web site their customers visit." Of course, if customers choose give up personal information to a service provider as a matter of voluntary contract (e.g., for some promised benefits), then that's completely legitimate. But mandating such data collection is outside the proper scope of government. "Pac-Man Proved NP-Hard By Computational Complexity Theory"
"The Looming Threat of a Solar Superstorm"
"Tiny Tunable Terahertz Beam Could Enable Real Handheld Tricorders"
"Funny titles mask serious science". Here's the full list. "Leap seconds may be abolished in 2015"
Glenn Reynolds (aka Instapundit) discusses the latest SCOTUS ruling at, "Supreme Court Privacy Ruling Is About More Than GPS Tracking". Thomas Edison's To Do List From 1888. "When a cell phone ringtone interrupted his viola recital, Slovak musician Lukáš Kmit responded by improvising his own classical version of the Nokia ringtone"
"What Does a Conductor Do?" "Astronomers aim to take first picture of black hole"
"Warrants Needed for GPS Monitoring, Supreme Court Rules"
"Man shoots nail into his brain, posts it to Facebook from ambulance"
"What? What?! This is huge! This is like ten CDs in one. How many songs does it have on it?" Why did Kodak go bankrupt while Fujifilm thrived? Surprisingly, Kodak acted like a stereotypical change-resistant Japanese firm, while Fujifilm acted like a flexible American one. This is reminiscent of how Borders went bankrupt, whereas Barnes & Noble successfully adapted to the digital age. Court stenographers normally record proceedings on both paper and digital disk. But Terlesa Cowart, stenographer at Chaviano's 2009 trial, forgot to bring enough rolls of paper and relied on digital recordings alone to chronicle proceedings. She transferred this data to her PC and erased it from the stenograph. Cowart has been fired for the monumental screw-up, The Miami Herald reports. Bad move. The PC subsequently became infected by an unidentified virus, causing the destruction of the records. No secure backup was taken, so the state will be put through the expense of a second trial that will cause, at the very least, inconvenience for witnesses and heartache for the victim's family. Update #2: Evan Brown dissents from the Khan Academy video. Update: Politico reports on 1/20/2012, "PIPA bill vote canceled by Harry Reid". The proponents of PIPA/SOPA are now regrouping and redoubling their efforts to force these egregious pieces of legislation into law by forcing a vote next week in the Senate called "Cloture", which in effect forces Senators to vote for a bill as written without debate or amendments. They are doing this as fast as possible because they know opposition is building and they still think they have the votes necessary to pass PIPA. Although some Senators have said they are working to "fix" the bills to address some of our concerns, they may not get the chance. It is imperative that we tell our Senators to vote NO on "Cloture". Please help spread the word, as this is a process most Americans are not familiar with, and need to understand if they are going to speak up in time. Use this link to contact your Senator. For the fourth year in a row, more LPs were sold than in any other year in the SoundScan era; last year, sales soared to 3.9 million, up from 2.8 million LPs in 2010. Of the 228 million physical albums sold in 2011, nearly 2% were vinyl. Two-thirds of those albums were purchased at independent music stores. "Man with two hearts survives double-sized attack"
"Dear Student: I Don't Lie Awake At Night Thinking of Ways to Ruin Your Life"
PJM OpEd: "SOPA, Guns, and Freedom"
What's the Best Animal to Slice Open and Crawl Inside to Stay Sarm? What's the best animal to slice open and crawl inside to stay warm? New algorithm from MIT: "The faster-than-fast Fourier transform"
[A] group of MIT researchers will present a new algorithm that, in a large range of practically important cases, improves on the fast Fourier transform. Under some circumstances, the improvement can be dramatic — a tenfold increase in speed. [Off-topic] My latest RCM OpEd: Why Is Creating Value Good, But Profits Bad? Off-topic:: The 1/17/2012 edition of Real Clear Markets has just published my latest OpEd, "Why Is Creating Value Good, Profits Bad?" "English Wikipedia to go dark January 18 in opposition to SOPA/PIPA"
Keith Schacht: "The virtue of price discrimination"
"What happens if you ask Google Images what's most similar, starting with a blank image, repeating the process 2951 times?" "Can You Walk on Lava? Falling into Lava Revisited"
Computer mouse with "13 buttons and six programmable modes for up to 78 potential commands". For the Museum of Modern Art's Talk to Me exhibit, MIT's SENSEable City Lab created a piece composed of 40 laptops that were sent all over the world and programmed to transmit data and images from their environments back to MIT. Fast forward some months and one of those laptops had entered common usage at the Lab. It was left on a desk and stolen in a burglary. (Of all the luck!) How do you think this crime caper might end? This is a story with a moral, after all. "Deep In The Heart Of Stuxnet"
17 tablet computers were hyped last year at CES 2011. Where do they stand one year later? 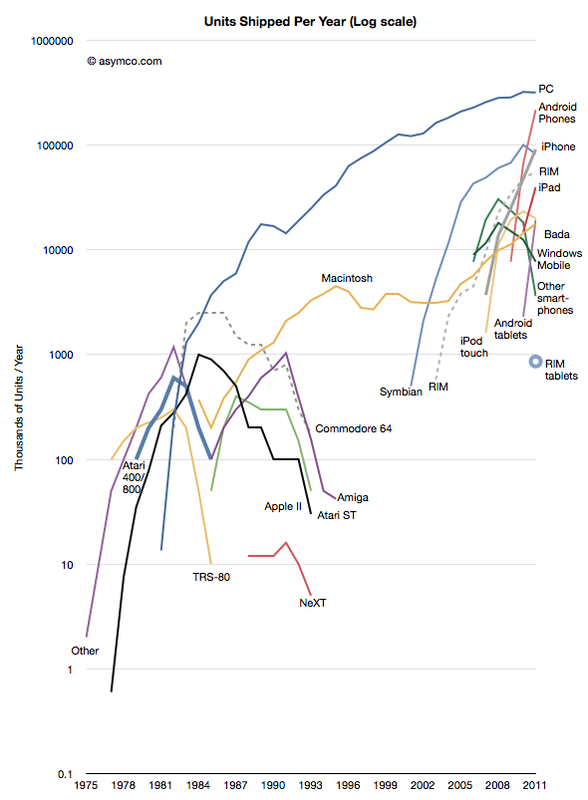 We broke down the trajectories of 17 tablets from CES 2011. In the final tally, I think you could say one is a qualified success (the Asus Eee Pad Transformer), one did OK (the Motorola XOOM), and several flopped (Dell Streak, RIM Playbook) or made no impact (Coby Kyrus, Cydle M7 Multipad, Naxa NID-7001). Nine never were heard from again. "Mafia Now The Biggest Lender In Italy"
"How (not) to communicate new scientific information: A memoir of the famous Brindley lecture"
Rand Simberg discusses why alarmist talk about China going to the moon is wrong at "The Lunar Yellow Peril". "Twitter Revealed Epidemic Two Weeks Before Health Officials"
Astronomers said Wednesday that each of the 100 billion stars in the Milky Way probably has at least one companion planet, adding credence to the notion that planets are as common in the cosmos as grains of sand on the beach. We will have a leap second on June 30, 2012. "The Age of Ships: A time before passenger jets, when ocean liners were 'the greatest of the works of man'". I especially liked the story Vladimir Yourkevitch, who fled Russia after the Communist takeover and had to take a job in France as a riveter in the Renault factory. The image of an poor immigrant factory worker trying to persuade the chairman of a major French shipyard that his revolutionary new ship hull design would work is something straight out of fiction. That ship would later set a Transatlantic speed record. "Self-healing electronics restores broken connection in microseconds"
Business is booming for this Tweeting cabbie. Markets in everything: Communion wafers. Includes familiar themes of commoditization, industrialization, marketing battles, knockoffs, etc. My favorite line from the article: "We take a lot of pride in putting our family name on a product that will eventually become the body and blood of Jesus." Auto-appendectomy in the Antarctic: Case Report. This really takes a lot of guts. Update: The original link appears broken, but here's a cached version at The Internet Archive. Why Can't We Use Lasers As Ray Guns? Each lens is able to changes its molecular structure, changing the focus as needed. There is a transparent LCD layer to the lens that with the accelerometer detecting motion, sending a signal to the LCD layer. This changes how light is refracted and is comparable to the varying thickness of traditional glasses. Let's Blame The Brain Tumor! "California lawmaker claimed brain tumor led her to shoplift thousands from Neiman Marcus"
"A court in Paris, France has fined Google $65,000 because its search engine's autocomplete feature brings up the French word for 'crook' when users type the name of an insurance company." Off-topic: PJMedia has published my latest piece, "The Truth About RomneyCare". "Pentagon Scientists Use 'Time Hole' to Make Events Disappear"
Related story: "Split-second events cloaked in time may aid computer hacking"
Scotch In A Can. No, really. 11 Surprisingly Popular Magazines You've Never Heard Of. Can You Pick the Stradivarius? "Double-Blind Violin Test: Can You Pick The Strad?" Update: Link was broken, but is fixed now. Building a better suntrap: MIT researchers "have invented a way of concentrating the energy in the sun's rays without the need for mirrors. It is, quite literally, a suntrap." "Why Best Buy is Going out of Business...Gradually"
Grammar geeks will want to check out the Apostrophe Protection Society. It's time for "Dave Barry's 2011 Year In Review"!